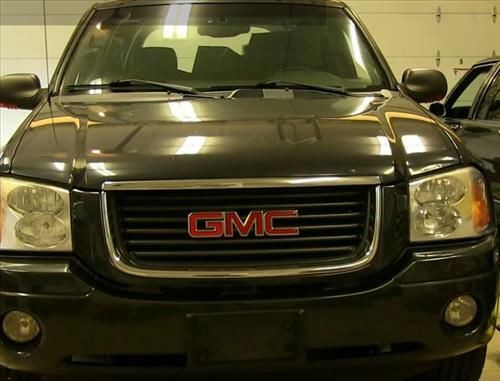 replacing the Headlight Bulb on a 2002-09 GMC Envoy, Envoy XL XUV is not difficult and falls into the DIY category. As always if in doubt take your vehicle to a professional. Below are the steps with screenshots to replace them along with a video if needed for a visual walk through. 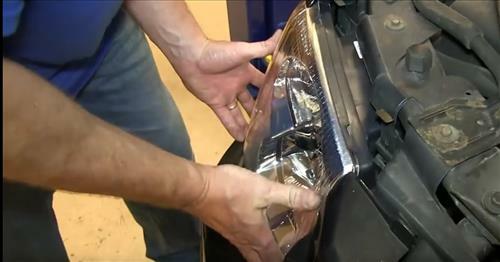 1… Pull the hood release to pop the hood open on the driver side. 2… Lift your hood support it. 3… Go over to the headlight that you want to service or replace and lift up on these two tabs and ours pull up. If you have some trouble pulling them up you can use a pair of pliers to hold. 5… Use a flat-blade screwdriver pry out on the tab for the wiring and disconnect the harness. The bulbs twist counterclockwise and pull out. 6… Remove the headlight bulb for both Low and high-beam by pulling off the boot and twisting the bulb counter clockwise and it pulls out. 7… Lift up on the tab on the harness then disconnect it. 9… On the left is the old headlight, on the right is a new one, you can see they’re identical and they’ll fit exactly the same. 12.. After that, you have to adjust the angle of the lights you just turn this counterclockwise to raise the light or clockwise to lower it. Just to show you what the difference new headlights can make to your vehicle, here’s the old headlights and the new ones you can see it just makes the vehicle look a lot younger and newer.